Democrats and the media may be unmoved by the grief and pain of angel families whose loved ones have been killed by illegal immigrants, but their message is resonating with suburban women throughout the country. Suburban women were widely credited with tipping the scales for the Democrats in the 2018 midterm elections, but President Donald Trump is now drawing them back into the GOP fold with his unwavering commitment to end the humanitarian and security crisis on our southern border. According to a new Zogby Analytics poll, the president’s recent executive actions to fund construction of the border wall are even more popular among suburban women than they are among likely voters in the broader population. A plurality of suburban women — 45 percent — support my father-in-law’s executive actions, compared to 37 percent of likely voters, and an impressive 50 percent back his decision to declare a state of emergency. “Even though most voters do not agree with the president’s recent actions regarding the border, suburban women do favor his policies,” pollster Jonathan Zogby explained. 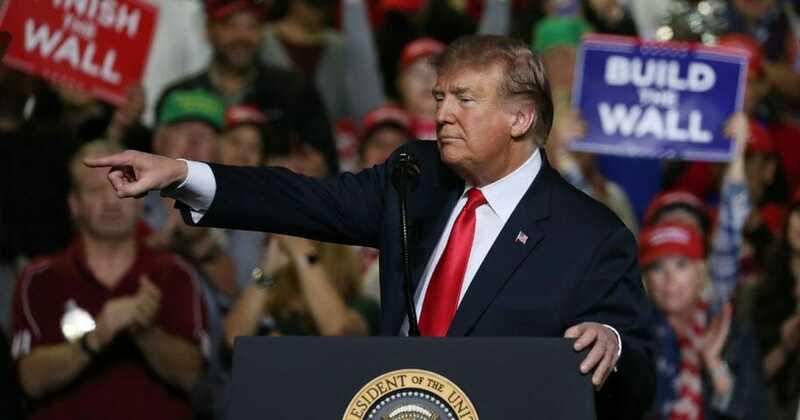 “The ‘border wall’ or ‘border fence’ will be a key issue he can utilize to help his re-election chances, especially as his Democratic opponents move further to the left regarding immigration policies,” Zogby predicted. Throughout the battle over border wall funding, Trump has made a point of highlighting the human suffering caused by rampant illegal immigration, inviting numerous angel moms and dads whose children were killed by criminal illegal aliens to share their stories with the nation. Meanwhile, thousands of Americans are dying each week because of one of the worst drug epidemics in American history — with most of the narcotics coming through the southern border. As my father-in-law noted during his State of the Union address, more Americans now die from drug overdoses in a single year than were killed during the entirety of the Vietnam War. It’s not just American citizens who are hurt by illegal immigration, though. Trump has repeatedly pointed out that countless women and children are trafficked and abused during their arduous journey to sneak across our exposed southern border. In fact, one out of every three women who make the trip north to illegally breach our border are sexually assaulted. We owe it to them and the countless women and children who will inevitably attempt this journey to make it less enticing by building a structure that isn’t easily crossed. Democrats have tried to justify their obstruction of necessary funding for border security by claiming that border walls are “immoral,” but that argument rings hollow in comparison to the immorality of allowing the humanitarian crisis on the border to continue. Trump has made that case convincingly, and the American people noticed. The support of suburban women will be crucial to Trump’s reelection in 2020, and the Zogby poll indicates that his compassionate rhetoric on border security is making a major difference for this important voting bloc, which is now evenly divided in its approval of his overall job performance. The Democrats’ heartlessness is costing them the support of the suburban women they depended on in 2018, and that could very well help cost them the 2020 election.